"What kind of people are you?" So you know those moments. You spend some quality time with an engaging friend. A little later you realise that geography will make it very difficult to see this person regularly and you fall out of touch with only an old address in the address book. Christmas cards litter un-welcomed on welcome mats in houses the person has long since vacated. And then, through no act of your own, that person comes back into your life because of some small fateful coincidence (in this case a low cost DVD offer) and you curse the years that have past because of the joy he/she (or even it) has brought you. In my case, this evening, the fateful coincidence was a sticker that said £6.99. I was stuck working away from home and wanted some DVD entertainment to make the evenings a little more bearable. £6.99. I was astonished the night before, to find not a single film available at a local Blockbusters that I had wanted to see. The more modern the crop (that's not a typo but it should be), the more un-watchable the product – and believe me, today it IS product. So I cruised a recently opened HMV and was on the look out for bargains. There was a film I hadn't seen in a long while. £6.99. I remembered it fondly and snatched it up only to realise that this was a long lost friend that had come back to me. I had re-watched about 45 minutes and I was immediately convinced that In The Heat Of The Night is one of the very best acted American films ever made. OK. Let's acknowledge what makes this movie sparkle. The answer to this, I'm reluctant to say, is simply stated, black and white. It is not the plot (as Slarek has rightly pointed out). Take away the race relations and you have a pot boiler detective yarn with little originality. Staple gun the black and whites into place and you have an astoundingly effective and wrenching study of a warped sociology amid once worthy historical flotsam and jetsam; a huge African American population now lived as second class citizens rather than indentured slaves in the cotton picking southern states of the US. This was the sixties and things were not hunky dory down south. The events that inspired Mississippi Burning happened just a few years earlier. Things would change (imagine The Simpsons' Marge muttering one of her 'Hmmm's) but I still recall my father telling me after he settled into a barber's chair in the sixties in a US state that shall remain nameless. "I was bundled up and thrown out by two burly black guys. I was dumbfounded. They said 'This is for coloureds.'" I was startled as a child by that story and as I grew up I found out that the world did not 'work' the way I had been led to believe. Having my tonsils out in the sixties, I was in a hospital ward next to a black kid. Jesus, I still remember his name, hullo Derek. This was the second black kid I'd ever encountered but he was a Stingray fan so could not have been any different to me in any way. What was skin colour? But it matters to some evidently. We fight wars over land and resources. We kill for money and most inexplicably we claim superiority over other races because of geography and skin colour. How nuts was that? Racism is alive and still (depressingly) robust in 2005 so let's take a moment out to dissect prejudice. Guess what? We need prejudice in every waking minute of our lives. You see, there is a difference between chocolate and vanilla ice cream (stay with me, this isn't a metaphor) and in order to function we make choices. We do it with people too but socially acceptably, based on mutually shared ideas and character make up. For example – "…John thinks 2001 A Space Odyssey is over-rated." This invites a judgement of sorts. Could I make a bosom friend from a human being that does not acknowledge Stanley's artistic credentials? That depends on how shallow I allow myself to be – but skin colour? I acknowledge that (on an almost hourly, perhaps minute-ly basis) choosing A over B is necessary. How could we possibly peacefully exist staring at a menu at a restaurant? But skin colour? Let's face it. Isn't it true that people (all colours, all creeds, all races) have the almost infinite capacity to be nasty bastards one minute and saints the next? Colour is just colour but racism is, at a very basic level, ignorance and faulty learning. Movies probably changed nothing in the grand scheme of things but if one racist thug came out of ITHOTN with some sort of random brain wave firing nudging him to see people as people and not as races then 'that 'ain't' a bad thing'. I suppose that the obvious is what divides us (men vs. women, black vs. white, Lars von Trier vs. Michael Bay) but the skin colour thing to me was always something of a ludicrous premise, like seeing a carrot gang up on a pea. Both vegetables and in my world as a kid, both despised!) My best friend in school was Sri Lankan, a brown skinned boy of prestigious intellectual ability (my brain skill was not as respected but I did a good line in surreal – I once avoided a fight – after throwing a coin accidentally into a bully's face – with the cry "Yeah, but what about the penguins?" He was confounded for days after that encounter but I didn't get beaten up). Skin colour has always been a mundane aspect (in my job of making films for TV) of simple lighting. I directed a sequence involving several African rangers and was crushed to find that after many different grading changes (attempts to make out face detail by changing the colours and brightness of the shots), the guys resolutely remained looking like black mattes in green fatigues cruising through the bush. But then we did make the dumb mistake of shooting them at noon. Shine a light directly over a dark skinned person and watch those details disappear. An important man has been murdered in Sparta, a small town in a southern US state in the year Bobby Moore hoisted aloft the World Cup for England (1966). The astonishingly racist and (frankly) thick policeman (a young Warren Oates before he became iconic as Lyle Gorch in The Wild Bunch) has decided that a black man waiting for a train (the only thing 'different' – apart from the murder – that night) was ripe for arrest. He's black so he's so obviously guilty. Oh, it fair boggles the mind. I can't think what 2005 audiences could possibly make of a society based in 1966. 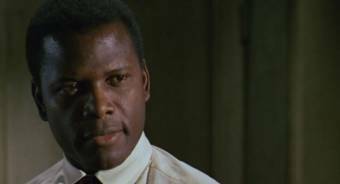 Silent and commanding, the black man (the role that really launched Sidney Poitier despite The Defiant Ones almost a decade earlier) complies with the police officer. 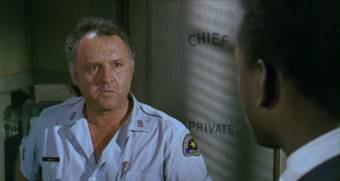 He is handed over to the chief of police, Rod Steiger, in a role that would also define this talented, gruff, character actor. Purely due to the black and white charge of electricity in the scenes, there's not one dull exchange in the entire movie. When Steiger finds out that not only is this black man probably not guilty of murder, he's also a police officer (and better than Steiger) and let's not forget that the 'suspect' also earns more money in a city week than our chief of police in Sparta makes in a redneck month… Sparks flying are words that do not do this scene justice. It sends little shivers up the spine, shivers of pure delight at the sight of actors engaging in their craft so well that it would stun me to see a behind the scene production still. This had to be real, no? Poitier, now revealed as fellow policeman Virgil Tibbs, is forced to stay on to clear up the murder. One slight problem. He's wearing white man's clothes (this is an actual line and writing it out and even staring at the words still do not convey how awful it must be to live in a society so divided by mistrust and fear). A suit and a tie aren't for coloureds so in this society (as the police are quite happy to point out) this would mean Virgil's death. For being black in Sparta in the sixties and nicely dressed is a death sentence and it's all the more horrifically absurd because people have been killed for more petty reasons than this… But it still makes me wince with the rampant stupidity of it. But then if you are brought up to hate, you hate. The answer to most problems in the world is education. We all share DNA but not luck nor circumstance. Those of us lucky enough not to wake up worrying about where our next drink of water is coming from should think about figuring out how to solve the problems of those who wake up to that thought. There is a scene quite early on in In The Heat of the Night about which I must share an odd confession. Steiger takes Poitier to examine the corpse. Notable, apart from the pantomime racism from the coroner's assistant, the scene is quietly sensuous and I can't tell you why. It's a mixture of Poitier's studied and gentle intensity (let's not forget intelligence) and the way the camera pans and tilts carefully over the corpse with Poitier's delicate hands and fingers as the guide. The way he turns over the dead man's hands ("New manicure…"), examines a white rigor mortis foot and generally treats the dead man with (and I say this aware of how ridiculous it sounds) almost a lover's attention to detail. I used to re-watch this scene because it made me feel light, almost drunk on the sensuality of Poitier's examination. And yet the scene is also notable for a barked line of dialogue that I am yet to summon the nerve to imitate. Steiger gets a call at the morgue. He is already exhausted, baffled and frustrated and the phone call can only add to his woes so he cuts to the chase; "Talk to me," he says. Just another of ITHOTN's little but potent pleasures. In ordinary Hollywood movies, characters come to like each other, respect each other and bond. Oh boy. On watching ITHOTN, you are kept being teased to believe that eventually before you walk out of the cinema, these two characters standing for cultures only miles apart but with worlds of difference, will come together to see the wisdom of the truth etc. But bless them all for having the balls to make Poitier's visit change virtually nothing. In a scene which teases this most successfully, Poitier is being entertained by Steiger. It's just the two men at Steiger's plain home supping beers and throwing back the firewater. Poitier is aware that he has detected the smallest crack in the police chief's brusque manner after Steiger admits that he doesn't have many friends and no one he entertains at his home. He actually calls Poitier one of the "chosen few". Poitier extends a line towards some sort of mutual respect (this is the point at which most movies hurtle down cliché alley) but Steiger bats his offer back harshly and elicits a sort of anti-Hollywood shock moment. He says, completely destroying the mood, "Now don't get smart, black boy…" You can see Steiger mentally relaying Poitier's earlier line "No lonelier than you," in his head before he replies. This is a very smart actor playing mentally slower than himself. It's a joy to behold. It's the first double take in thought I've seen on screen. And the imdb.com states that this scene was made up of dialogue improvised by the actors at the time – then we are simply not worthy… Bravo. All the way through the movie Steiger physically defers to Poitier. He opens doors for him, sits in the backseat of a car to let him ride up front and he even carries his bags for him. It's a wonderful and subtle way of Steiger managing to maintain his overtly racist persona but also show Poitier the respect he knows he deserves being a much better policeman than Steiger for a start. When Steiger does nothing except gawp open mouthed at a confrontation between the plantation owner Endicott and Poitier (the two men slap each other), we get the revelation that all the while we've been watching the film, seeing Poitier as Virgil Tibbs standing for our own civilisation (from the future, a pluralist paradise, ahem) we were wrong, oh-so very wrong. Poitier, showing some fire wants to bring that 'fat cat' down off his hill. Steiger (again showing us what he's thinking before he announces it) just says "Oh boy, man you're just like the rest of us. Aint ya?" It's a telling moment and does two things. It drags Poitier down into the dirt where we all play and it also shows a self awareness in Steiger of his overt racism. Despite the two leads' superlative work, it's an actress that walks away with the most stunning scene. Lee Grant as the dead man's widow is in Steiger's office but Poitier chooses to be the bearer of bad news. I know 'showy' acting is not necessarily a good thing (less is frequently more) but as a youngster, after I saw this scene, I felt I knew what great acting was and I stand by that today. Grant is absolutely mesmerising. Most of her greatest moments (and this diminishes not one iota of her achievement) are with her back to the camera but you really have to marvel at the scene to believe it. Poitier lends admirable support but it's Grant's moment. Of extra interest, soon-to-be-director-of-note himself, Hal Ashby, edited In The Heat of the Night and there are editorial flourishes that are more marked by their absence – where are the shots of Lee Grant's reaction to her husband's death? I'll bet they were shot and I'll bet Ashby and director Norman Jewison concluded that the scene played better on Poitier and her extraordinary reaction from behind. Framed at 1.85:1 and anamorphically enhanced, the colours are faithful and warm and evocative of a charged community. You just know this originated on film... The feel is perfect celluloid. The contrast is solid but black levels creep from now and then into a murky grey making grain evident but not distracting. Never enough to throw you off.Haskel Wexler's gorgeously stifling cinematography. There is very little sparkle or dirt to speak of. The sound is mono encoded in Dolby Digital 2.0. Regrettably the director and cast commentary on the Region 1 didn't make it across the pond. The so called extras here are (drum roll) one very dirty pan and scanned 4x3 trailer, of historical interest. A solid Region 2 disc with no extras save the trailer but at £6.99, there will be no complaints about lack of supplementary materials from me but yes, I'd gladly pay £15-20 for a jam packed double disc special edition….